My friends, we need to talk about petitions. I’ve referenced in the past that petitions are an ineffective waste of time and resources and you shouldn’t sign them or circulate them, but there is actually an exception. That exception is petitions being circulated for the purpose of getting candidates or measures on the ballot — those actually do have a real effect that can be negative or positive, and many people don’t exercise due diligence when it comes to carefully evaluating them. When you live in an area as filled with politically active people as I do, signature gatherers trying to fill petitions to get something on the ballot are quite common, and you have to develop some adroit skills when it comes to dealing with them. (My current default: Lying and saying I’m not a registered voter here.) I refuse to sign petitions for several reasons, including the fact that most of them are bad (my distaste for initiative and referendum, let me show you it), that I don’t have enough time to carefully evaluate the measure in two minutes outside the produce section, and that signature gatherers commonly rampantly lie. Here’s the thing. Ballot measures themselves are often written in extremely misleading ways, designed to confuse voters so they vote against the interests they want to represent. While the state (and county, in the case of local measures) are supposed to review them to prevent this kind of thing, and issue a clear explanation for the voter guide with information, they don’t always do such a hot job. A lot of voters don’t read the guide. Some get confused and start circulating bad information. Some deliberately circulate bad information, counting on people to trust them and repeat it. It’s a snarled mess. That’s really magnified during the signature gathering stage. 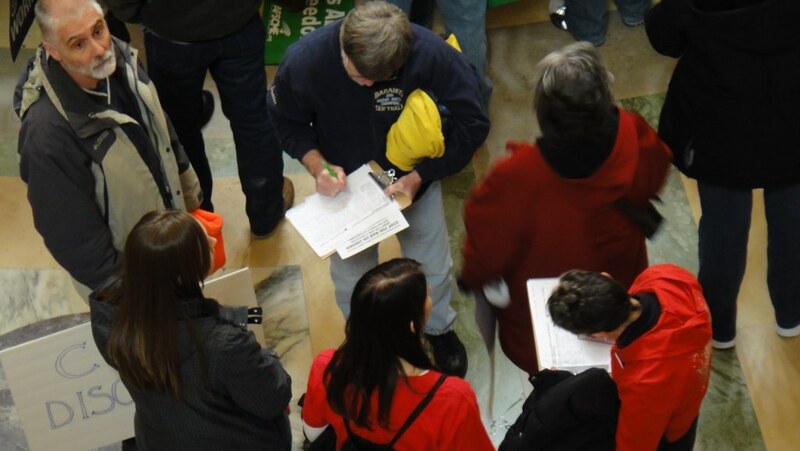 Depending on who is collecting signatures, they may be paid, and their employers don’t care how they get signatures. Others are just super passionate about whatever the thing is. Either way, they’re not above being extremely misleading or saying things that are outright untruthful — sign this and X will happen, don’t sign this and Y will win, etc. The goal is to pressure people into making a snap decision before they have an opportunity to think about what they are doing. So when you’re approached by someone with a petition to sign, know that you are well within your rights to refuse, and that it’s actually a very good idea. If they pressure you to sign anyway, that’s a very bad sign and it suggests that you made the right choice. I know that we live in a culture of niceness, where people, especially women, are repeatedly told that they need to be nice and friendly and fun to be around, and that saying ‘no’ can be really difficult, especially when being bullied by someone in public, creating a situation where you don’t want to make a scene. Remember this: When people are being rude to you and edging up on your personal space and boundaries, they are the ones who are choosing to make scenes, and you are not responsible for that. It is okay to lie, as I do. It is also just okay to repeatedly say ‘no, I told you I am not interested.’ It is okay to turn your back and walk away. It is okay to flag someone down and ask for help. While signature collecting is a first amendment activity, harassing people is not and you can request that a staffer or business owner remind people that they are not allowed to harass members of the public who are trying to conduct business. If the petition sounds interesting and relevant to something you support, please do your research. Don’t ask the person gathering signatures for information, because they have an agenda. Instead, go read the text (they have to provide it on request and you may be able to find it online as well). Read analyses by neutral parties if you’re not comfortable reading proposed legislation or something is complicated and you want to make sure you understand it. Any time you read an analysis, follow the money. Let’s say it’s a ballot measure about marijuana. First, find out who is trying to put it on the ballot and where their money is coming from. If it’s being brought forward by the industry, that should tell you something about its purpose and how it was written. If it’s brought forth by other parties, look into their agenda. How would the ballot measure serve them? As you gather arguments for and against, look at the authors and consider their stance on the issues — law enforcement at varying levels may have perspectives you do or don’t agree with, for example, just like medical marijuana patients’ unions, or dispensaries, or local elected officials. Think about your own stance on the issue as well as you go through commentaries and analysis. If something gives you a funny feeling and you have a lingering sense that you are missing a key piece of the puzzle, it’s okay to skip out and decide against signing the petition. That can be a warning sign that something hinky is going on, even if you can’t quite put your finger on it. If you find, after reading, that you support the ballot measure, seek out a person who’s collecting signatures and add yours — but make sure it will be valid (typically registered voters in the area affected by the measure are the only people who can provide valid signatures).